For help with your roof repair or re-roofing project, we recommend scheduling an on-site consultation, which includes a free roofing cost estimate. We can guide you through the process and make sure you get the best solution for your home. If you do need a new roof, our roofing specialists will help you choose the right shingle or roofing material to match the style of your home. Call us at 1-855-561-6143 or click below to request your on-site evaluation and free estimate! 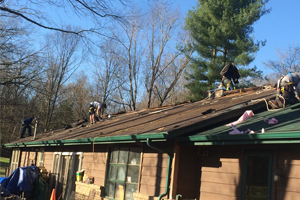 We provide roofing services in O Fallon, St. Peters, Warrenton, and throughout Missouri. If your roof is old or you've noticed signs of a roof problem, we can assess your roof to determine if a re-roof is best and provide you with a free estimate for replacement or the services you need. Brian (Sweet) is one of the nicest young men I have met. And his presentation was wonderful! Just delightful, very rare, very impressive! I am most anxious and looking forward to working with your company! We had multiple "Contractors" out to give us estimates on replacing our roof. Freedom Restoration and Roofing was the only company who actually got on the roof! I couldn't believe no one else would. Brian with Freedom even got in my attic and inspected the plywood. He used a GoPro to take a video of what he was looking at and showed it to bith my husband and me. Brian's product presentation was 1st class. All I got from the other "contractors" was two emails and one I still haven't heard from. Choose Freedom if you want it done right!! My wife and I were impressed with Brian initially. The installation crew did not disappoint either. A wonderful company to work with. We were referred to Freedom Roofing from a neighbor that had a great experience. Freedom was fast and very accomidating. They worked with my insurance company and helped us through a stressful time selling our home. Thank you Freedom Roofing! Great job! We went out of town the week Freedom put out our new roof. When we got home we couldn't believe how great our new roof looks! The cleanup was great too, I never would of known they were there if it wasn't for the new roof! Great job Freedom! Honest. Hard working. The crew was very polite. Brian was very transparent with the process. Could not be happier. If your roof needs to be replaced, you’ll have to decide whether to install the new roof over the existing one or tear the old one off. A complete re-roof ensures that water-damaged sheathing will be found and repaired, preventing future issues. Our contractors will recommend the best options and provide a free quote for your project prior to beginning any work on your home. Ready to schedule your roofing cost estimate? Contact us today to schedule your free in-home consultation on the cost of our services with a professional from Freedom Restoration & Roofing. We are your expert roofing contractor serving St. Louis, St. Charles, Chesterfield, Florissant, Wentzville, Troy, Ballwin and many surrounding areas.